The Kennedy Space Center - Ultimate Tour ticket combines all the elements of the Kennedy Space Center with Transportation Ticket with a host of extras. So, as well as enjoying a private guided tour of the amazing Space Shuttle Atlantis exhibit, a NASA Bus tour with stops at the Observation Gantry to see the launch pads, the Saturn V exhibit area and the amazing Shuttle Launch Experience. After being collected from one of the convenient pick-up points (see below), get ready to experience the huge range of unique attractions and interactive exhibits at Kennedy Space Center Visitor Complex. Tour NASA’s spaceport and see space shuttle launch pads included in the Kennedy Space Center Bus tour. Walk beneath a massive Saturn V rocket and relive Neil Armstrong’s first steps on the moon. Meet a real Astronaut, stroll through the Rocket Garden, and enjoy five-story IMAX® space films. A real highlight is sure to a guided tour of the Space Shuttle Atlantis exhibit - this display brings visitors nose-to-nose with the priceless Atlantis spacecraft as only astronauts have seen it before. You will also get to enjoy the following inclusions. 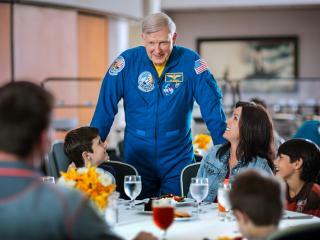 Lunch with an Astronaut program: A once-in-a-lifetime chance to have lunch with a real life astronaut. Hear first-hand about space adventures from someone who has experienced a launch and the wild ride into orbit. See photos and videos from the astronaut’s missions, ask questions and snap a photo with your new astronaut friend. It is a buffet lunch that varies seasonally but a meat, pasta; vegetarian, family choice will always be included along with a Desert Selection / Ice Tea, Soda and Coffee. KSC Explore Tour - A 2-hour tour offering access to areas normally only open only to NASA personnel and the chance to capture once-in-a-liftetime photos of the giant structures that make up the World's Largest launch facility. See many of KSC's most historically significant buildings including the KSC Headquarters, the newly renamed Neil Armstrong Operations & Checkout Building where astronaut crews spent the final days before their flights and the International Space Station Processing Facility, where components of the ISS were built before being ferried into space. Get an up-close look at the coastal launch pads that unleashed the power to put people on the moon and send space shuttles to the International Space Station and stop for photos outside the 525-foot-tall Vehicle Assembly Building (VAB). Inside these high-bay doors, the Saturn V moon rockets and space shuttles were stacked and prepared for launch. gram, the Orion capsule aboard the Space Launch System (SLS). Along the way, your tour guide will share historical facts about the sights you’re seeing – vehicles, buildings and structures crucial to current and past operations. The tour culminates at the Apollo / Saturn V Center, home of the Largest rocket ever built - a 363-foot long moon rocket. On the morning of your departure you must make your way to one of the following conveniently located pick-up locations. The Kennedy Space Center - Ultimate Tour collects from central location points in Orlando and you will need to make your own way to the nearest collection point which will be detailed on your voucher. NASA reserves the right to cancel or alter locations and/or security requirements for the Kennedy Space Center Explore Tour without notice. Please note shuttle pick-up locations generally require a change of vehicle before travelling to Kennedy Space Center. Free parking is available at the following pick up points (subject to change without notice), Lake Buena Vista Resort and Spa, Wild Side Bar & Grill, Firehouse Sub at Crossroads and The Rosen Inn international. Local parking charges apply at The Swan Hotel at Disney and Universal Resort Bus Loop. Parking is not available at Rosen Inn Pointe. Is a hotel pick-up included in the Kennedy Space Center - Ultimate Tour price? Kennedy Space Center with Space Pass and Transportation collects from central location points and you will need to make your own way to the nearest point. The pick-up locations are arranged so that you do not need to travel too far to your nearest point. The actual location will be given at the time of booking when you advise us of your hotel. In the event that you do not have your hotel information available at the time of booking, you will be advised of your pick-up point when you call to reconfirm your tour in the resort.